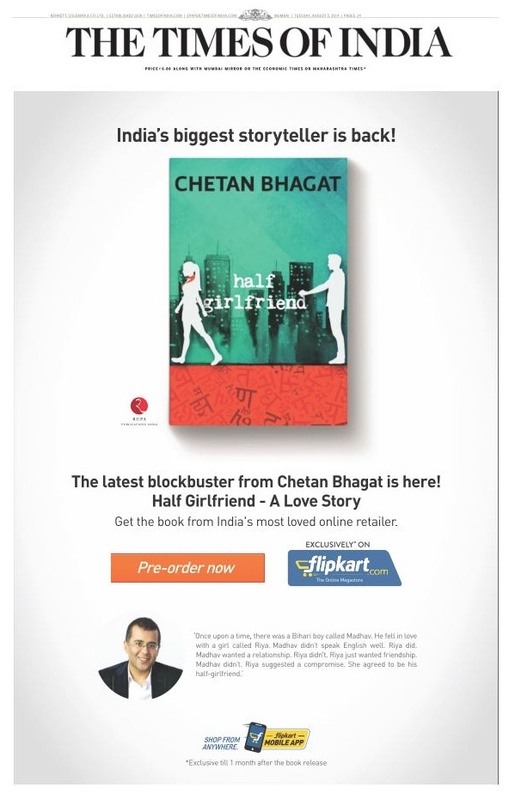 Online retailer Flipkart raised $1 billion last week from investors, and they spent close to Rs 2.4 crore this morning to release the front page for Chetan Bhagat’s new book Half Girlfriend on the front page of the Times of India across the country. In return for the ad, which has had the whole book industry abuzz, Flipkart has the exclusive rights for selling the book, not just for pre-ordering, but also for a month after it is released in October. The question of course, is whether Flipkart would ever make any profit out of the book after having spent this much money on the ad. We have done some calculations based on conversations with industry insiders, and this what it looks like: Flipkart is selling the book currently at a 15% discount to the cover price of Rs 175; they will probably be required to give 50% of the selling price of each copy as royalty to the publisher Rupa as per standard industry practice; another 15% would be spent on affiliates who drive the traffic to their website ,and delivery expenses. So in all likelihood they would be left with about 20% of the selling price as profit. Considering that they have spent Rs 2.4 crore on the ad, it will thus require them to sell more than 500,000 copies to recover the cost alone. That is quite something for even an online bookseller. Flush with funds,Flipkart is obviously looking upon this as a marketing exercise for itself, while riding on the back of India’s most popular author. Bhagat no doubt will be laughing all the way to the bank himself. Those in the know estimate that he could probably end up making around Rs 35 a copy as his share of the royalty, which means that he could make as much as Rs 1.75 crore from Flipkart alone. He will probably end up selling another half a million copies through regular book stores and other online sellers after the expiry of Flipkart one month exclusivity. And knowing Bhagat’s standing in Bollywood, there would be the inevitable royalty from film rights. No wonder he has even created a you tube teaser trailer for the book, which you can watch here. Book store chains like Crossword and Landmark are probably hopping mad over Flipkart monopolizing India’s best selling author for a month after the book is released. So the questions is whether they would stock the book at all after this snub. Would they risk losing whatever money is left to be made after Flipkart has squeezed its millions. It will also be interesting to see what Flipkart’s big rival Amazon will do. Would they stock the book, or would Half Girlfriend end up with just Half a E-Retailer.